Like much of the sculpture of the Romantic movement in French art, Préault's work was rejected from the Paris Salons throughout the 1830s and 1840s. Official recognition came after the Revolution of 1848. This plaster group is the working model for the commission of 1867 for the imperial palace at Fontainbleau. 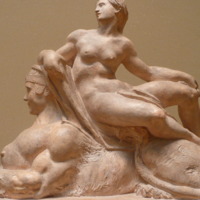 Auguste Préault (French, 1809–1879), “Venus and the Sphinx,” Mapping Mythology: A Digital Collection of Classical Mythology in Post-Antique Art, accessed April 22, 2019, http://www.mappingmythology.com/items/show/90.